Gold, coral, and diamond bracelet and pendant. You are here: Home / Jewelry / Bracelets / Gold, coral, and diamond bracelet and pendant. They were listed in the same Bonhams auction and photographed together, but not sold as a set. I think they make a glorious pair. Let’s look at the pendant first. Such an interesting shape, isn’t it? 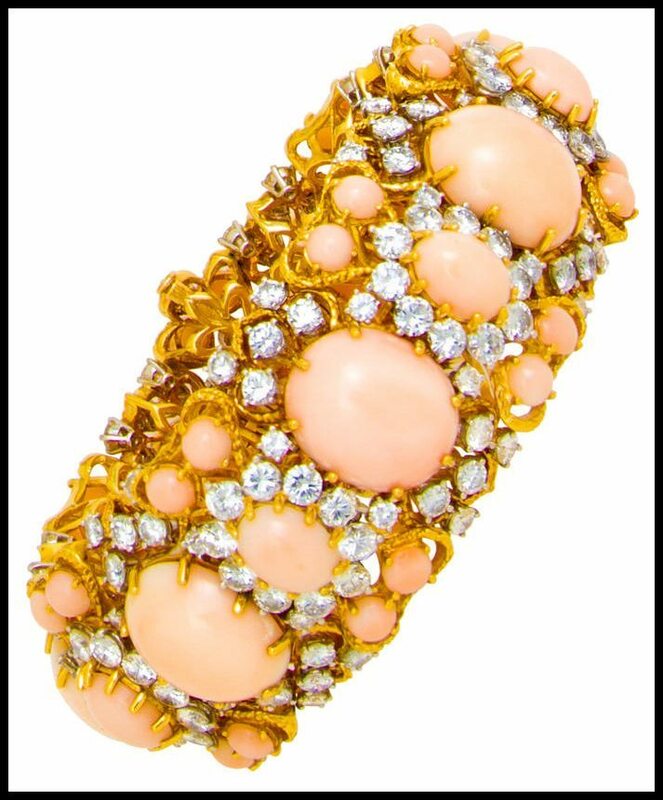 It’s designed as a pavé-set round brilliant-cut diamond ribbon suspending two coral drops. It’s bigger than you might imagine from the picture: the length is listed as 4.5 inches and total diamond weight as 8.35 carats. I really wish there was a picture of it a on a chain; I want to know where the pendant loop is and if it would hang vertically or list to the side. I’d love to see this on a longish chain. Maybe 20 inches? 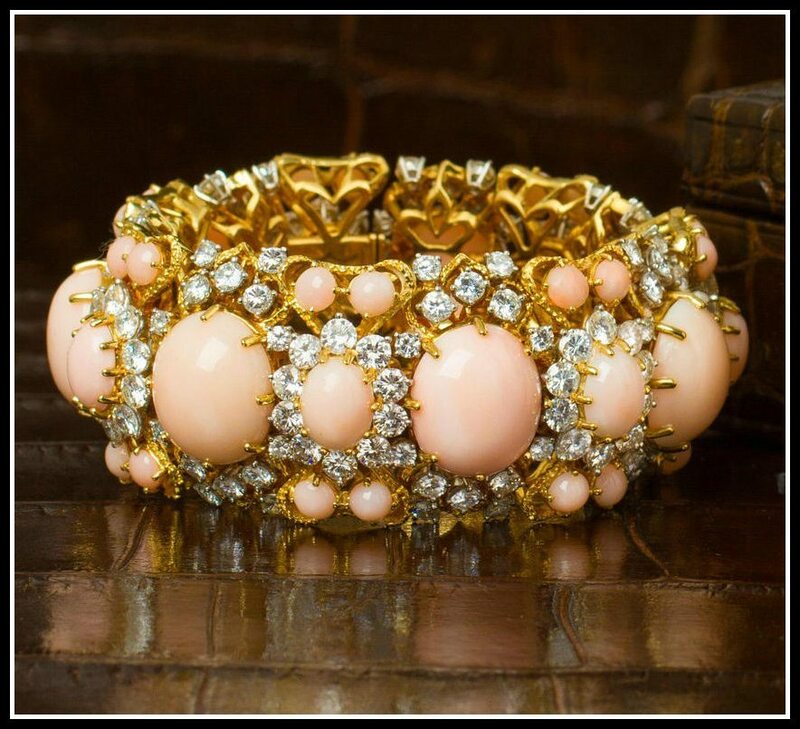 The bracelet is 18 karat gold and features pale pink coral cabochons and 28 carats of round brilliant cut diamonds in a textured wirework mount. The design in general feels a little dated, but I think this pretty piece could be brought into the 2000’s pretty easily with the right styling. You’d just need to contrast the sweetness with something angular and tough, maybe pair it with leather or and asymmetrical LBD. You’d also have to not have my skin tone – which is almost identical to that coral. Here’s a side view. It really is a piece with a lot of volume, and such marvelous texture. What do you think, would you wear it? How about the pendant? 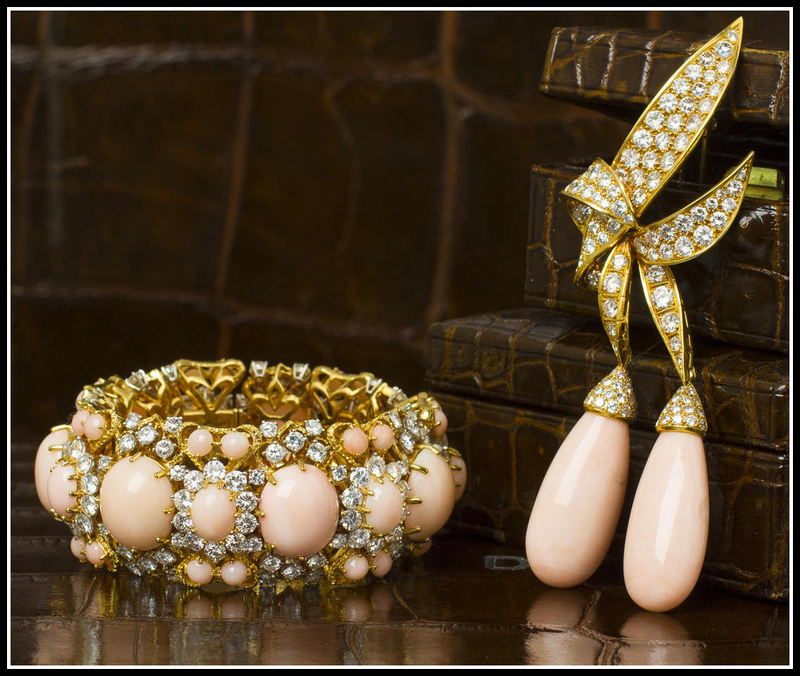 Both of these gold, coral, and diamond pieces were listed in an October 2013 Bonhams auction. All images and info are thanks to Bonhams.